Saint Petersburg is one of the world's most beautiful cities. There are many cities with a longer history in Russia. Many cities have a wide variety of attractions and interesting places. But, nevertheless, Saint Petersburg attracts attention of large number travel enthusiasts. It is no doubt, that main city of Russia, the center of tourism and business life is Moscow. St. Petersburg has its own, unique charm. It is a city which certainly should be visited. According to statistics St. Petersburg was visited by about 6.5 million tourists in 2015. Approximately 2.6 million people out of this number were foreign tourists. Tourists are attracted to St. Petersburg by its interesting history (for over 200 years, the city was the capital of Russia), the world-famous sights, museums and theaters. The largest number of tourists in St. Petersburg comes from European countries: Germany, Great Britain, France, Italy, Spain, Finland. Tourists from China nuber increases every year. You can get to St. Petersburg by plane (Pulkovo airport), by rail or by bus from Helsinki and Tallinn or by ferry from Helsinki and some other cities. On these pages you will find a lot of interesting and useful for tourists’ information about St. Petersburg. This Saint Petersburg tourist guide offers information about the city's attractions, the most popular museums, the best theaters of St. Petersburg, interesting for tourists’ places. It may be useful to know while planning a trip in Saint Petersburg. You can ask your questions about Saint Petersburg in the relevant section of the website. Attractions. Major attractions and places of interest. Theaters. The most famous theaters of St. Petersburg. Transport. Subway, train stations, the airport of St. Petersburg. Where are located, how to get to. City map. Map of St. Petersburg with location of the most important and interesting objects. Photo Gallery. Pictures of the most beautiful places in St. Petersburg. Countries. Popular tourist destinations in Europe. Accommodation. Find a good place to stay (hotel, hostel, apartments) in St. Petersburg. St. Petersburg is one of the largest cities in Russia. It is the northernmost city in the world with over one million people population. According to statistics, the city is home to over five million people. The city was founded May 27, 1703 by the most famous ruler of Russia, Emperor Peter the Great. Construction of the fortress began in the day on an island on the Neva River. The city was rapidly developed. The first shipyard has become operate in St. Petersburg already in 1705. Saint Petersburg became the capital of Russia in 1712. Bodies of state power of Russia have been placed in St. Petersburg for about 200 years. Headquarters of the Emperor of the Russian Empire were located here. Luxurious palaces and beautiful parks was built in the city. Saint Petersburg historic center and associated set of monuments was included in the UNESCO World Heritage List. Tourists will find a lot of interesting places in St. Petersburg for themselves. Nevsky Prospect is the city's main street. Its length is about 4.5 kilometers. The street runs from the Admiralty and Palace Square to the south-east to the Moscow Station (Vosstaniya Square), and then continues to the Alexander Nevsky Square and Alexander Nevsky Lavra. There are six subway stations near the Nevsky Prospekt: Admiralteiskaya, Gostiny Dvor, Nevsky Prospect, Ploshad Vosstaniya, Mayakovskaya, Alexander Nevsky Square. 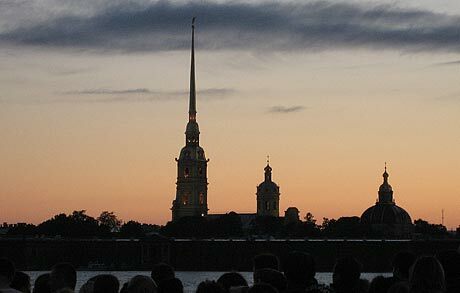 June and early July is the time of the White Nights in St. Petersburg. The shortest night and the longest day falls on 20 - 21 June. This is the best time to visit the city. You can walk all nigh these days (if weather permitting) on the streets and quays of the city. Date of the city foundation - 27 May 1703. The number of inhabitants (2016) - 5 225 690. Total area - 1399 km². Telephone code - +7 812. Number of bridges - 342. The warmest months - June, July, August. The coldest months - December, January, February. The city of St. Petersburg has a lot of attractions and interesting places for tourists. Most of them are located in a relatively small area in the central part of the city. Information about the most famous tourist sites with reference to the nearest metro stations is located below. You can find lots of information about attractions also on the other pages of the web site. “Peter and Paul Fortress.” Peter and Paul Fortress is the historical center of the city. Saint Petersburg construction began with the construction of the fortress. At the moment it is one of the main attractions of the city. Beautiful view of the fortress opens from the waterfront of the Neva River (near the Winter Palace). At the fortress territory operates “Museum of history of St. Petersburg”. “Palace Square.” Palace Square is the main square of St. Petersburg. Near the square are located many attractions. At the Palace Square is the Winter Palace – Russian emperors residence. In the palace is situated the most famous museum in Saint Petersburg - the Hermitage. “The Bronze Horseman.” It is monument to the founder of St. Petersburg - Peter the Great. This is the most famous monument of the most famous tsar of Russia. The monument is located near the banks of the Neva River, near St. Isaac's Cathedral. “Saint Isaac's Cathedral.” Saint Isaac's Cathedral is one of the most famous sights of Saint Petersburg. Its dome is visible from many places in the city. Near the dome of the cathedral is an observation deck for tourists. More information about the sights of St. Petersburg are on these pages…. There are more than 200 museums in St. Petersburg. Less than half of them are state museums. There are also many large and small museums belonging to different departments, businesses, private individuals. On this page is a summary of most famous museums of St. Petersburg. The State Hermitage is the most famous museum in St. Petersburg and one of the best museums in the world. The museum's collection includes about three million works of art and cultural values. The main exhibitions of the Hermitage are located in the Winter Palace, which is located on Palace Square in St. Petersburg. Find out more information about museum. Address: Palace Square 2, St. Petersburg, Russia. The nearest metro station: Admiralteyskaya. The Russian Museum has the largest collection of Russian art in the world. The museum is located in the Mikhailovsky Palace, next to “Ploščad Iscusstv” square, close to Nevsky Prospekt. Under the direction of the museum are also: Mikhailovsky Garden, Summer Garden, the Summer Palace of Peter I, House of Peter I. Find out more information about museum. Address: “Engenernaya” street 4, Saint Petersburg, Russia. Nearest metro stations: “Nevsky Prospekt”, “Gostiny Dvor”. “Museum of Anthropology and Ethnography named after Peter the Great” of Russian Academy of Sciences, better known under the name “Kunstkamera”. It is first museum in Russia. Museum was founded by Peter the Great. Year of the museum's foundation is 1714. Find out more information about museum. Address: “Universitetskaya” embankment 3, Vasilievsky Island, St. Petersburg, Russia. Nearest metro station is “Vasileostrovskaya”. Central Naval Museum is one of the oldest museums in Russia and one of the largest maritime museums in the world. Branches of the museum are “Cruiser Aurora” and Submarine D-2 “Narodovolets” (located next to the Lenexpo). History of the museum started in 1709. For a long time the main exhibition of the museum was located in the Old Stock Exchange building on the Vasilievsky Island. The museum is moving to a new location. Address: “Ploschad Truda” square 5, St. Petersburg. The nearest metro stations (Admiralteyskaya, Sadovaya Spasskaya) are located at a distance of about 1,5 kilometers from the museum. Museum of Artillery, military engineering and communication troops is one of the oldest museums of St. Petersburg. Peter I issued orders for old guns preservation in 1703. The museum traces its history from that time. The museum's collection includes more than 850,000 items. At the entrance to the museum (in the yard) are located more than 200 samples of guns, self-propelled artillery and missile systems. Address: Alexandrovsky Park 7, St. Petersburg. The nearest metro station is Gorkovskaya. Russian Ethnographic Museum is one of the largest ethnographic museums in Europe. The museum was founded in 1902 as a department of the Russian Museum. The museum has a department of ethnography of Russian nation, departments of ethnography of Belarus, Ukraine, Moldova, the people of the North-West of Russia, the Baltic countries and the peoples of the Caucasus, and other departments. The museum is located next to the Russian Museum. Location: St. Petersburg, Engineering street 4/1. The nearest metro stations: “Nevsky Prospekt”, “Gostiny Dvor”. The State Museum of History of St. Petersburg presents the history, culture and daily life of Saint Petersburg. The main museum exposition located on the territory of the Peter and Paul Fortress. Branches of the museum are also: “Oreshek” fortress in Shlisselburg, Rumyantsev Mansion, AA Block apartment museum, SM Kirov museum, St. Petersburg Museum of avant-garde, Defenders of Leningrad monument. St. Petersburg is a big city. The distance from the shopping center Mega-Parnas in the northern part of the city to the located south of the city airport Pulkovo is about 33 kilometers. The longest street in Saint Petersburg is Sofiyskaya. It has a length of 18.5 km. It is difficult to manage without public transport in such a big city. The most convenient mode of transportation in St. Petersburg is metro (subway). Metro carries the largest number of passengers. There are 5 lines and over 60 stations in Saint Petersburg metro. Subway stations are available at the most important places of the city. Find out more information about Metro in St. Petersburg…. Subway stations are not available in all parts of the city. Very often to get to the right place you have to use the bus. There are two group buses in St. Petersburg: social (municipal) bus routes and so-called commercial routes (mini buses). The fare on commercial buses is slightly higher. Commercial buses have a shorter time interval between buses and it stop anywhere (where allowed) at the request of the passenger. Trolleybus and tram are a good complement to the network of bus routes. The fare on the trolley bus and tram equals the cost of the social (municipal) buses. How to pay for a trip? For travel on the subway need to buy a single trip ticket (the metal “Zeton”) or electronic multiple ticket (contactless refillable card for multiple travel for long periods). There are many different types of long-term tickets (contactless cards) suitable for different types of transport. It can be purchased in the underground cash desks, which are available at each metro station. Pay the fare on the bus, tram or trolley is possible also by cash to the bus driver or conductor. St. Petersburg's main airport is the international airport “Pulkovo”. The airport is located just south of the city. Getting to the airport is possible by bus or taxi. More details about the airport “Pulkovo”. For more information about public transportation in St. Petersburg visit this page. “Admiralteiskaya” metro station. From this station along “Malaya Morskaya” Street is convenient to get to St. Isaac's Cathedral. Near are located “Aleksandrovskiy Sad” park and the Senate Square with monument the Bronze Horseman. From the waterfront depart speedboats to Peterhof. The distance from the metro station to the Palace Square is approximately 300 meters. Metro station “Gorkovskaya”. This is the nearest station to the “Peter and Paul fortress”. In the fortress, in Peter and Paul Cathedral, is buried founder of the city Peter the Great. Nearby, on the fortress beach, often are organized various events for tourists. Near the metro station “Gorkovskaya” are also located: a zoo, a museum of Artillery. The distance to the cruiser Aurora is approximately 1 kilometer. Metro stations “Nevsky Prospekt” and “Gostiny Dvor”. At the intersection of Nevsky Prospekt and the Griboyedov Canal is the Kazan Cathedral, the Singer House. Slightly south of Nevsky Prospekt across Griboyedov Canal spanned the famous “Bank bridge”. North of Nevsky Prospekt are located: Church of the Savior on Spilled Blood, the Russian Museum, Champ de Mars, a park “Summer Garden”. There are many options for accommodation in St. Petersburg. Travelers with any level of prosperity will find a place to stay for themselves. There are hotels for every taste and budget. For those who are forced to save, there are many hostels. You can also rent a flat (apartment) if you want to live "like a resident of St. Petersburg". The greatest demand for hotels and hostels is in summer (especially in the white nights season). It is better to take care of the place to live in advance, if you are planning a trip to St. Petersburg in the summer (as well as during school holidays and big holidays). Where is the best place to stay? 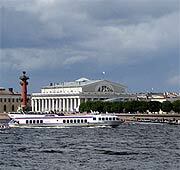 In summer, hotels with a view of the Neva River are in great demand. Hotels and hostels in the central part of the city (next to Nevsky Prospekt) is a good choice at any time of the year. If you are going to a specific place (for study, business trip, for treatment), then choose a hotel near this place. Many travelers prefer to rent an apartment with a daily payment during their trip. Such an apartment can be found using one of the specialized sites. (For example: AirBnb, Homeaway, Bookincom.) You will find useful links here. It is most convenient to choose a hotel for accommodation, which is located next to the metro station. You will find information about some of the nearest hotels on the pages describing the stations. It is useful to know, being in St. Petersburg, not to be confused in the names. As in all cities of Russia there are streets and “prospekts” in St. Petersburg. The exception is Vysilevsky Island. There are houses lines numbers instead of street names on Vysilevsky Island. On one side of the street is one line and on the other side other. For example, the metro station “Vasilyeostrovskaya” is located at the intersection of 6th and 7th lines with “Sredniy” prospekt of Vasilevsky island. There are streets with the same name in St. Petersburg. “Bolshoy” and “Maly” prospekts (streets) are available both on Vasilevsky Island, and on the Petrograd Side. As the name indicates, for example: “Bolshoy prospekt” PS (Petrograd Side), or “Maly” prospekt VO (Vasilievsky Island). “Aleksandrovsky” Park is located near the metro station “Gorkovskaya” and “Aleksandrovsky Sad” park is located near the Admiralty. Learn more about St. Petersburg (information, links and tips). The most popular attractions of the city. Book sightseeing tours and attraction tickets. Accommodation - hotels, hostels and apartments in St. Petersburg.